At first, Veronica Roth’s Divergent trilogy appears to follow very closely in the footsteps of the Hunger Games trilogy. Both are young-adult dystopian trilogies with strong female teenage protagonists. In both sets of novels, order is maintained through a rigid social structure, by which the majority of people are denied freedom of choice in how they wish to live their lives, and the protagonist has to fight against this structure. Although I have not read the Divergent series, I feel that I can pretty much guess how the story will play out, based on having read the Hunger Games series. 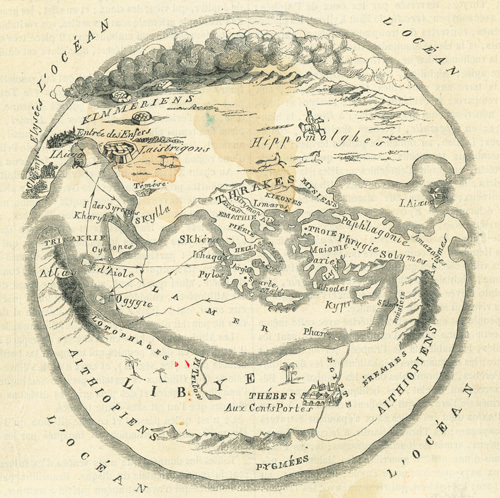 However, as I started to read more about Divergent, I became more curious about the world created by Roth, at least from a cartographical perspective. What is most interesting to me is that the story is set in a post-apocalyptic version of Chicago, many years in the future. This is in contrast to the world of Panem, of The Hunger Games, which is ambiguously located in former United States, without any explicit points of reference to current-day states or cities. 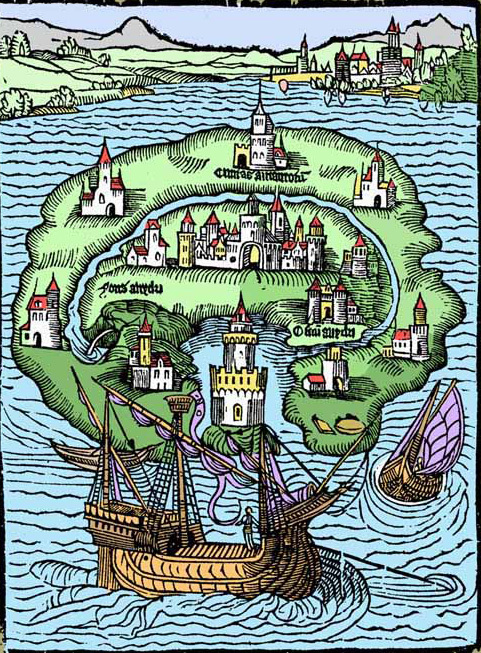 Other novels, such as The Maze Runner or The Giver, provide even fewer clues about their locations. Divergent is refreshing, at least, in providing a familiar setting for its characters. Its version of Chicago, however, has changed considerably from the city we know today. The highways are crumbling, bridges have collapsed, and many of the once-mighty skyscrapers have been reduced to skeletons. Most shockingly of all, Lake Michigan has dried up and been replaced by a marsh. 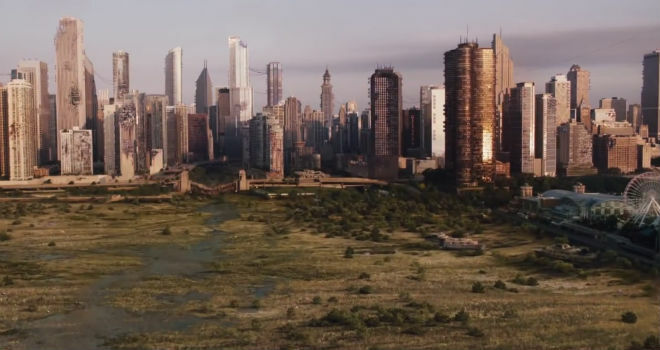 Below is a shot from the film version of Divergent, which came out last year, showing the Chicago skyline from the view of the marshy Lake Michigan. In Divergent, Chicago has been cut off from the rest of the world by a giant fence, purportedly for the safety of its residents. Each person is assigned to one of five factions (abnegation, amity, candor, dauntless, and erudite), which control parts of the city, and one’s faction is chosen based on the results of an aptitude test. It is basically like a personality test, classifying people as selfless, peaceful, honest, brave, or intellectual. Want to opt out of this process altogether? Then you will become factionless, and will be living homeless on the streets of Chicago. The main character of the series, Tris, undergoes this exam at the beginning of the series, and finds that she is one of the rare “divergent” people who do not fit neatly into one of the five groups. I do not know much more about the story, but from the looks of the movie trailers, action, adventure, and perhaps some romance, ensue. One ambitious fan of the series, @Jillian, discovered that there were no adequate maps of the Chicago of Divergent, so she went ahead and created her own on Google Maps. It is really quite impressive to see, as she has used her knowledge of the books to mark areas of Chicago which are the likely zones for the five factions. In addition, she marks points on the map where major events in the novels occur, such as Gateway Park, the site of the city’s giant ferris wheel. If you are wondering about her methodology for choosing her locations, she even provides citations and quotes from the books backing up her choices. Talk about thorough! Jillian offers a further explanation on this map here. Finally, the movie adaptation of Insurgent, the second novel in the series, opens in theaters this Friday, March 20. I’m sure that the legions of Divergent fans will make it another box office hit. But those who are curious about urban geography may want to check it out as well, if for no other reason than to see post-apocalyptic Chicago brought to life on the big screen. At 925 pages, Haruki Murakami’s “1Q84” is a beast of a book. The pacing is mostly glacial, with occasional spurts of excitement. The story meanders through a series of fantastical elements, many of which are ultimately unexplained. And it is full of Murakami’s favorite tropes: attention to the shape of ears, meticulously detailed accounts of food preparation, and the mysterious habits of cats, to name just a few. But unlike Murakami’s other novels, which are mostly critically adored in his native Japan and around the world, 1Q84 is polarizing. A New York Times review by Janet Maslin panned it, calling it “stupefying”. A sizable portion of Amazon customers and Goodreads readers were turned off by it as well, with several vowing never to open another Murakami novel again. Nevertheless, I still recommend this book… with reservations. 1Q84 takes place in Tokyo in the year 1984, but it quickly shifts into an alternate timeline dubbed “1Q84” by one of the characters. In Japanese, the word for “nine” sounds like “Q”, so there’s some wordplay which is lost on Western readers. The intended meaning is that it’s a year with a question mark, which is an apt symbol to describe the whole book. As in most of Murakami’s books, there are strange, powerful forces at work in this world which draw the main characters into deeply confusing, highly perilous situations. The protagonists are Aomame, a fitness instructor and sometimes assassin (but for a good cause), and Tengo, a writer who takes on a shady ghostwriting assignment. The point of view switches between the two throughout the novel, so we see how both sides of their stories play out for several chapters before they each find themselves endangered by a violent religious cult with connections to a group of mysterious supernatural figures called the Little People. It gets more and more ridiculous from there, as Aomame and Tengo struggle both to understand what’s going on and figure out how to survive. Unfortunately, the book does leave many questions unanswered, which can be very frustrating. As the plot moves along, events become progressively illogical, but only by our own standards of reality. By the internal logic of 1Q84, it seems to make sense, and I could not find any holes in the complicated plot. I found that the best way to deal with all the unexplained phenomena was just to suspend my disbelief and enjoy the ride. 1Q84 is very long, and perhaps several chapters could even be cut entirely. In the last third in particular, it seems to drag on, when the action should be building more quickly. However, I enjoyed the writing so much that I did not mind the length. 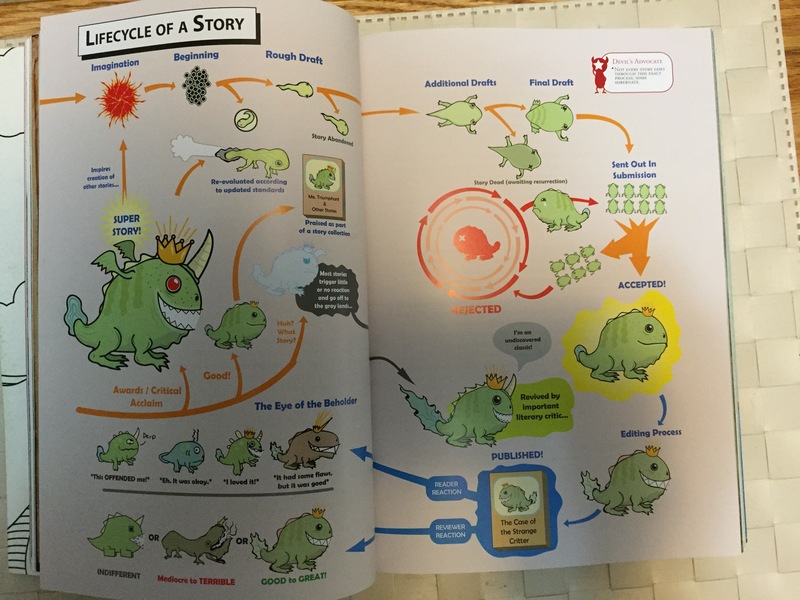 The characters’ personalities are deep and complex, and the style is clear and vivid. I read the book slowly, in fits and starts, over the better part of the year. Generally, I read a few pages, maybe a chapter, before bed. To me, the experience was less about seeing how the plot resolved, but more about the feeling of being transported inside that world. 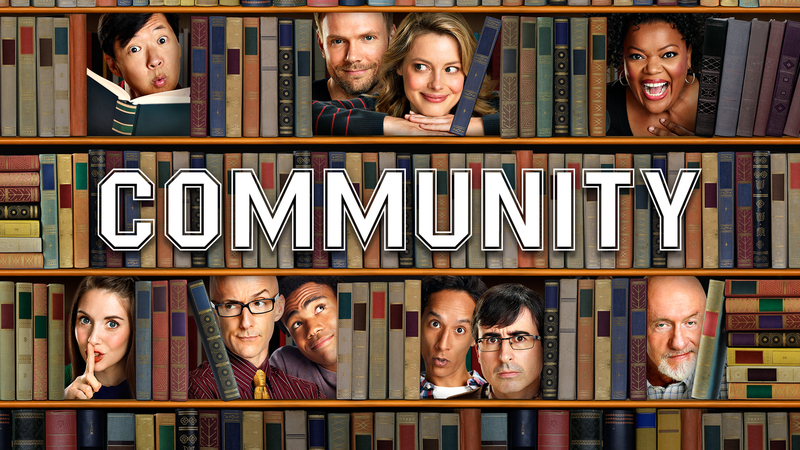 A common theme is solitude; almost all of the characters are alone, and they thoughtfully consider their situations as they go about their lives. Murakami describes in detail how they prepare food, what they wear, how they schedule their days, etc. Some readers have called this out as boring and repetitive, but I found it deeply enchanting. There is something profound about the mundane. 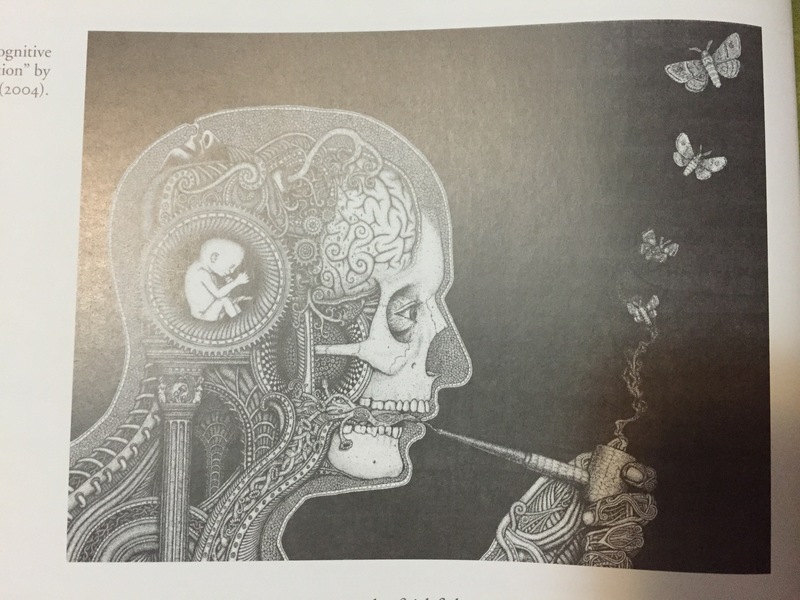 After all, it’s how we spend most of our lives. 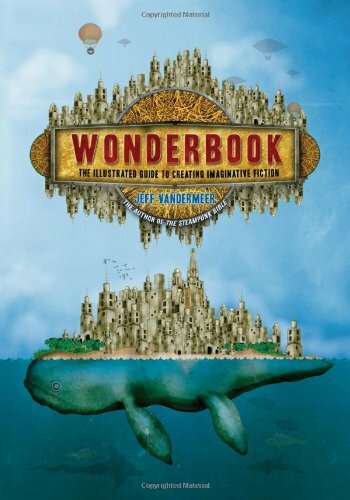 I greatly appreciated how this book kept its tone very grounded and contemplative, even as this seemingly normal world grappled with magic and fantasy. 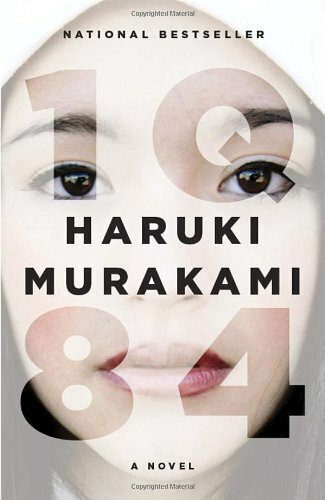 By all means, give 1Q84 a try, especially if you have read other books by Murakami. For those who haven’t, I recommend starting with one of his earlier novels, such as The Wind-Up Bird Chronicle, to get a sense for what he’s all about. His genre is hard to describe; it’s sort of a postmodern blend of magical realism, urban fantasy, and science fiction. That’s part of what draws me to his novels again and again. Since he defies easy classification, and his plots are always completely off the wall, you never quite know what’s lurking on the next page. 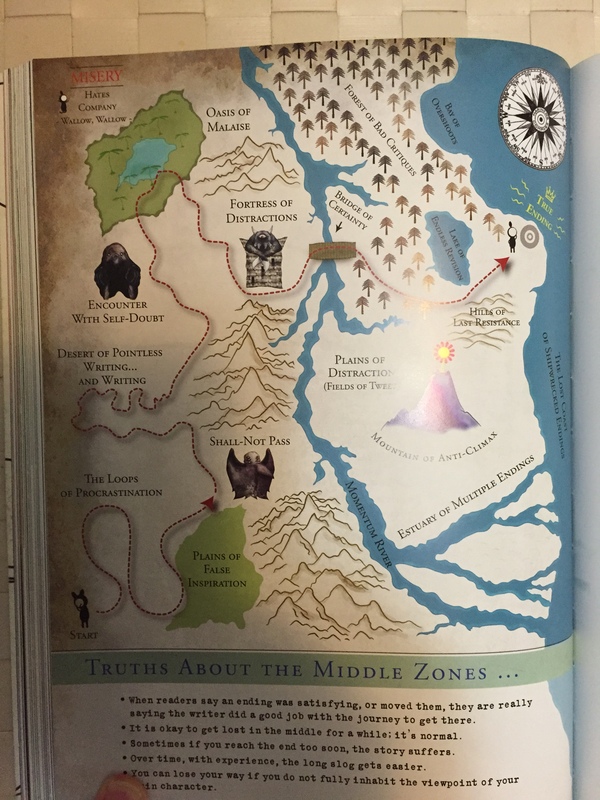 The hugely-successful and highly-addictive Hunger Games book series has one glaring oversight: The books do not contain a map of the world in which the books are set. 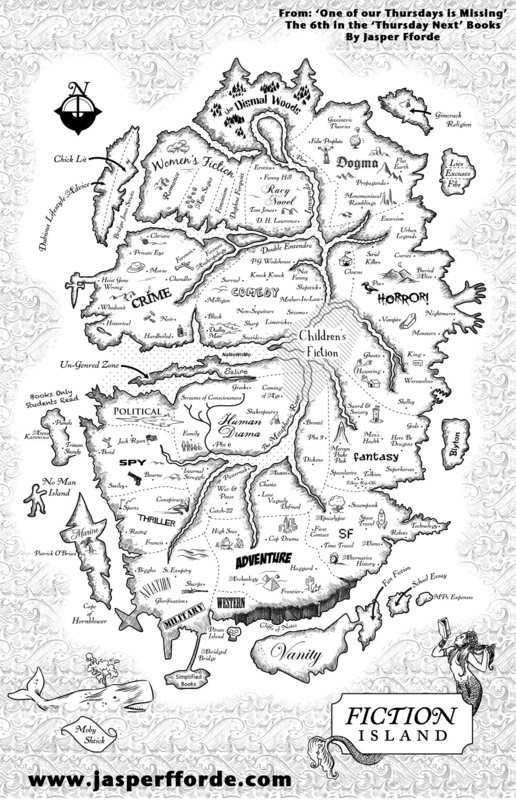 But have no fear, fellow cartographers, because avid fans of the series set out to create maps of their own. 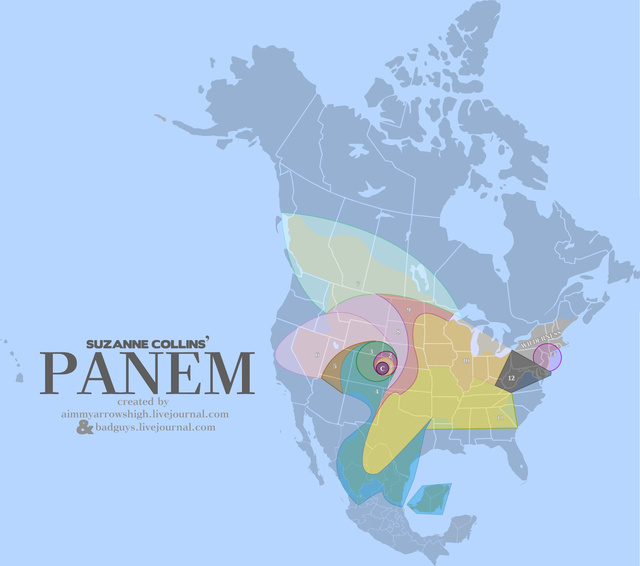 The Hunger Games is set in the country of Panem in a dystopian future North America. 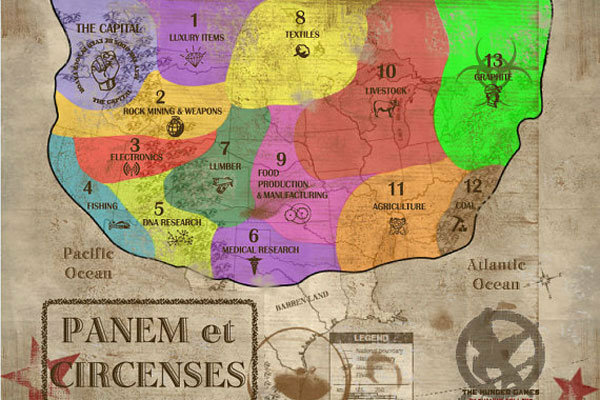 Panem is divided into 13 districts (one of which has been destroyed) which are ruled by the Capital, a city of great wealth and power that remains dependent on the supplies provided by the other districts. The Capital prevents the districts from rebelling against it by staging an annual event called the Hunger Games. It takes two children from each district and makes them battle to the death until one survives. The whole event is broadcast on TV for the entertainment of the people in the capital, and the horror of the people in the districts. It’s cruel and slightly ridiculous, but the books, and movies, are rather engrossing as we follow protagonist Katniss Everdeen after she becomes one of the contestants in the Games. I won’t say how, but clearly she survives the Games, as she’s popping up in trailers for part two, Catching Fire, which opens in theaters this Friday. I found it pretty impressive, given all the thought that went into it. 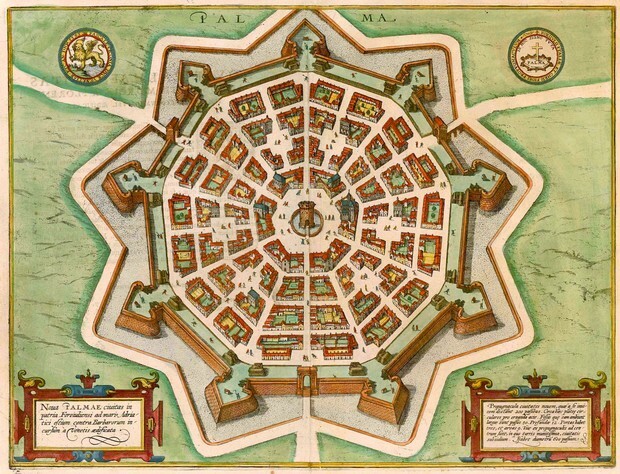 If you google image search for Official Map of Panem, this is the first image that comes up. Since no official map has been released, this is probably as close as we’re going to get. Kudos to the creators for their fine work! Happy mapping, and may the odds be ever in your favor.